Isaac Brynjegard-Bialik: Nice Jewish Artist: Cantor Wally CD available now! 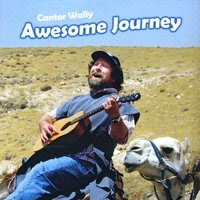 I did the design for Cantor Wally Schachet-Briskin's latest CD, "Awesome Journey," and it looks pretty sweet! If you're in the mood for some fun Jewish music with a lot of camp-style ruach and plenty of Yiddishkeit, check it out here. No camels were harmed in the making of this CD.